The thymus ensures the generation of a self-tolerant T-cell repertoire capable of recognizing foreign antigens. The selection of the T-cell repertoire is dictated by the thymic microenvironment. Among stromal cells, medullary thymic epithelial cells (mTECs) play a pivotal role in this process through their unique ability to express thousands of tissue-restricted self-antigens. In turn, developing T cells control the pool and maturation of mTECs. This phenomenon of bidirectional interactions between TECs and thymocytes is referred to as thymic crosstalk. In this chapter, I discuss the discovery of thymic crosstalk and our current understanding of bidirectional interactions between mTECs and thymocytes. 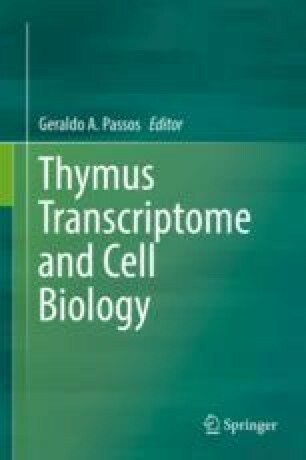 Finally, I summarize recent advances indicating that thymic crosstalk is not restricted to TECs and thymocytes but also occurs between TECs and dendritic cells, as well as B cells and thymocytes. This complex cellular interplay is essential for efficient T-cell selection. I gratefully thank Prof. Arnauld Sergé (Centre de Recherche en Cancérologie de Marseille) and Teshika Jayewickreme (Harvard University) for constructive comments. This work was supported by the Marie Curie Actions (Career Integration Grants, CIG_SIGnEPI4Tol_618541 to MI), institutional grants from Institut National de la Santé et de la Recherche Médicale, Centre National de la Recherche Scientifique and Aix-Marseille Université.